The campaign for the Sungai Besar by-election intensifies. 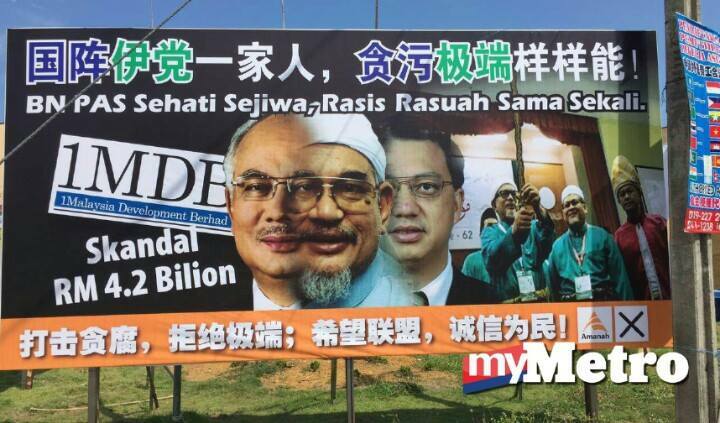 One of the billboards carried the images of Prime Minister Datuk Seri Najib Tun Razak, PAS President Abdul Hadi Awang, and MCA chief Liow Tiong Lai, captioned in Malay and Chinese with the slogan, "BN, PAS Sehati Sejiwa, Rasis Rasuah Sama Sekali" (BN, PAS One Heart One Soul, Racist and Corrupt One and All). 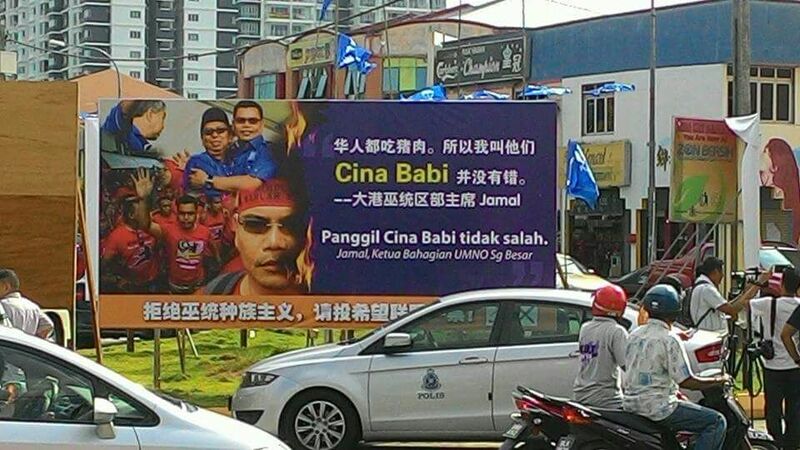 Another billboard carried the words "Panggil Cina babi tidak salah" (It is not wrong to call Chinese pigs) in Malay and Chinese, accompanied by images of Sungai Besar UMNO Division Head Jamal Md Yunus. 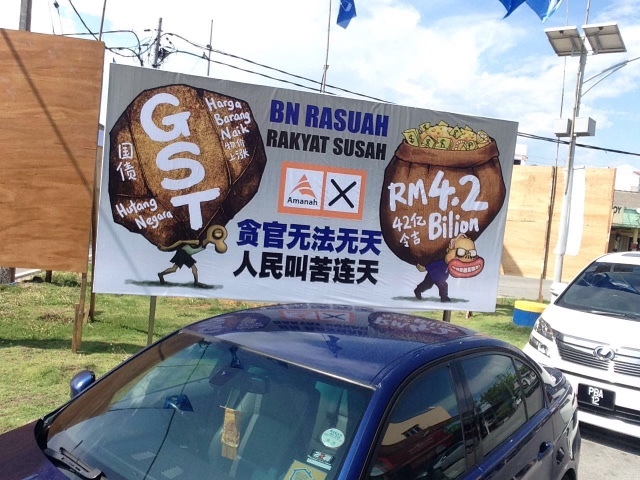 The billboards incited the wrath of Barisan Nasional (BN) supporters who had gathered at the area. Jamal made a surprise appearance then and ran over one of the posters in his four-wheel-drive vehicle. Jamal told his supporters, who were seen cheering upon his arrival, to calm down and not act hastily. "I have lodged a report with the police and EC officers so let them handle the matter," he said. "It's by us. (We put it up) this afternoon only," Selangor DAP chief Tony Pua told Malaysiakini yesterday. Pua reportedly defended the party's move, especially the banner which had a controversial quote by Sungai Besar chief Jamal Md Yunos. "We are only highlighting the fact that he (Jamal) as Sungai Besar chief said this about Chinese people," he was quoted as saying by Malaysiakini." "We wanted to highlight these issues. But the Election Commission has decided that they were against the election rules upon receiving complaints and hence the billboards have been taken down." Despite Pua's admission, it was reported earlier that DAP's Teresa Kok had denied knowledge that her party had anything to do with the billboards. "We don’t have enough money for this kind of rubbish… this can be reported to enforcement officers in the election commission," Amanah communication director Khalid Samad was quoted as saying by Malay Mail Online. According to Khalid, Amanah has no intentions to engage in smear tactics and he stressed that the cannot afford to pay for campaign flags in the constituency, let alone print posters that could incite hatred. "The act shows the Opposition is running out of issues and trying to raise racial issues," he was quoted as saying by FMT. "They have no more capital to attack Budiman, the BN candidate, so they had to resort to this dirty tactic. I am calling on voters not to be influenced by this provocation." 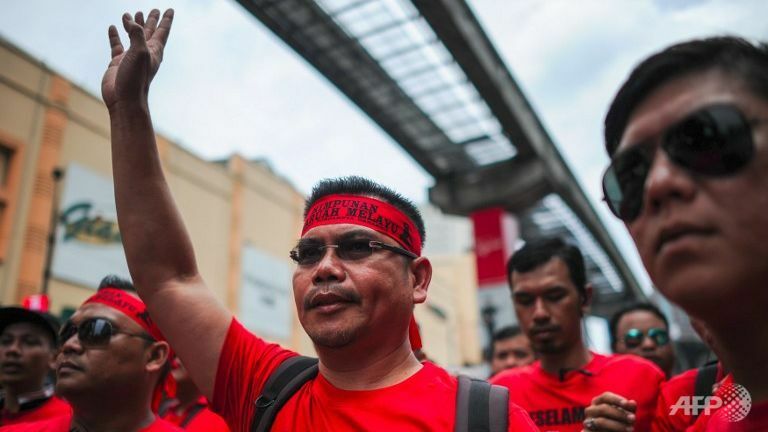 Last September, Jamal, who is the leader of the Coalition of Malay NGOs responsible for the 'Red Shirt' rally, made headlines after he reportedly called a reporter "Cina gila babi" (crazy Chinese pig). All in the spirit of 1Malaysia.